When it comes to protecting your home from the rain and snow, only a high-quality breathable roofing felt will do. Introducing the Cromar Vent 3 Classic Breathable Felt, the latest and most cutting-edge innovation – one that is guaranteed to transform your roof and provide you with many years of reliable service. This incredible product is lightweight yet durable and will provide you with the best breathable roof underlay the market has to offer. The Cromar Vent 3 Classic Breathable Felt is suitable for a wide range of cold and warm roof applications. At the heart of the Cromar Vent 3 Classic Breathable Felt are high-tensile polypropylene layers around a microporous polypropylene film. Thanks to its 3-layer spun-bonded high-performance breather membrane, this product will provide you with a well-rounded performance. The outer layer boasts impressive waterproofing qualities that will protect your home from rain and snow. A breathable waterproof membrane is found within the middle layer and the internal layer will protect the membrane from abrasion and damage. This design not only provides excellent tensile strength but also accounts for the product’s exceptional tear resistance. As any homeowner will tell you, the last thing you want is to find that your roof has been damaged by strong winds. With the Cromar Vent 3 Classic Breathable Felt, you won’t have any such issues as this product is guaranteed to protect against high wind uplift forces. This product is also UV stable, so it won’t fade or become damaged as a result of continuous exposure. Whether you’re looking to drape the product unsupported over rafters or apply it directly over the insulation, the Cromar Vent 3 Classic Breathable Felt will not let you down. 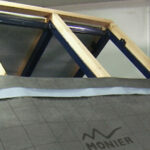 This product is intended to be used in a fully supported or unsupported metal, slated or tiled roof system. So whatever the nature of your project, you can be certain that this is the right product for you.